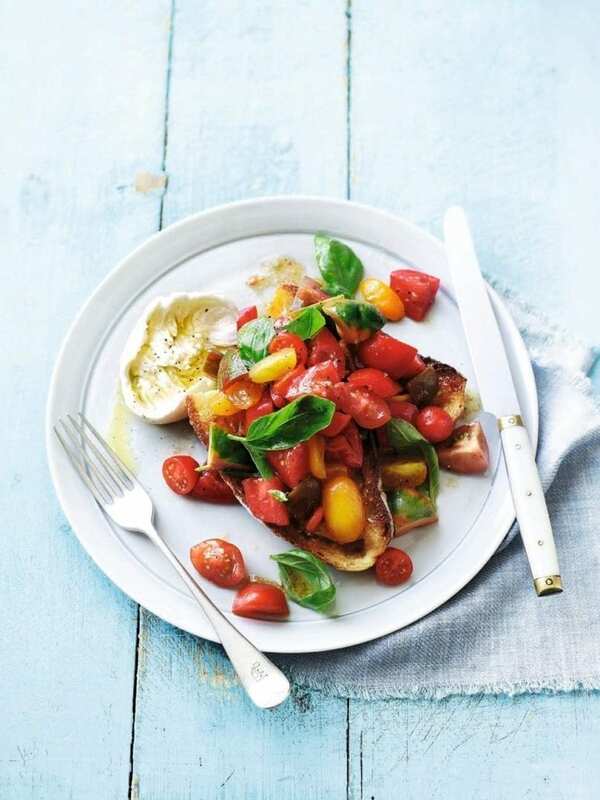 This simple tomato recipe is quick to make and tastes amazing with fresh, in-season tomatoes. Roughly chop the mixed cherry tomatoes, then put them in a bowl. Toss through the moscatel or red wine vinegar, a couple of generous glugs of extra-virgin olive oil and a good amount of seasoning. Set aside for 10 minutes. Meanwhile, toast the ciabatta or sourdough bread until golden. Halve the garlic clove, then rub all over one side of the toasts. Taste the tomatoes and add more seasoning or vinegar if needed, then tear a bunch of fresh basil leaves and toss through. Spoon the tomatoes over the toasts, letting the juices soak in. Tear the buffalo mozzarella ball and add to the plates. Drizzle with a little more extra-virgin olive oil, add a grind of black pepper, then serve.